Working on becoming a better leader for your team? Start here. I began teaching in 2008 and, through all of the meetings, trainings, conferences, and graduate degrees that taught me how to become an effective educator, I never stopped wishing I’d had that information earlier when it could have helped me be a better ultimate captain and coach. When I reflect on my early days leading an ultimate team, I realize that the four concepts I struggled with were understanding motivation, being too controlling, giving bad instructions, and understanding how to use failure constructively. If you are new to a leadership role on your team, it’s important to see yourself as an educator, and understand that your approach is important to both the emotional health and on-the-field success of your team. In this article, I’ll detail what teaching taught me about being a more effective leader of an ultimate team. Each of your players is motivated in different ways for different reasons. Before I became an educator, I not only failed to recognize that my teammates’ differing motivations were valuable, but directly questioned any motivation that did not closely resemble my own. This led to a lot of negative, “prove yourself” approaches to drills and practices. The result was a significant thinning of our roster. The people who thought like me stuck around and everyone else left. My inability to understand motivations hurt our ability to recruit and retain players. Some of your players want to be the best, some want to be better than they were last year, some want to learn how to play ultimate, some want to have fun and get exercise, and often players want some combination of all three. Beyond their personal reasons and motivations is the idea that there are two main types of motivation: intrinsic and extrinsic. Intrinsic motivation stems from an appreciation of the activity itself. Think, “I love to run because it’s relaxing.” Extrinsic motivation stems from possible rewards earned from the activity. Think, “If I run outside of practice, I’ll be a better ultimate player.” Everyone falls into one of these main motivation categories. If you design team activities with both types of motivation in mind, you’ll be more likely to create more enjoyable experiences for everyone. How do you know if someone is more intrinsically or extrinsically motivated? You can ask them, but it’s possible they don’t know themselves. Through a combination of getting to know your players and observing them in practice you can learn more about how to best design team activities to benefit them. For example, in practice you may mix in activities where individual players, or smaller groups of players earn points. Many teams will take an offensive vs. defensive line approach, or create other squads for in-practice competitions. This activity will be more enjoyable for extrinsically motivated players—they’ll want the points, or outside acknowledgement they’ve accomplished something. Designing activities for intrinsically motivated players can be a bit more tricky, especially if you have limited resources for practice which force you to stick to a tight schedule. Consider building in some free time. A classic use of this is the end-of-practice scrimmage. If you remove yourself as a captain or coach and allow your players to simply play and enjoy the game, you’re more likely to connect with those who are intrinsically motivated. The more you think about ways to integrate both motivation types into each team activity, the more likely you are to keep the entire team motivated and enjoying their time together – even when the work is challenging. Highly motivated players are willing to work hard and, if their individual motivation preference (intrinsic or extrinsic) is accommodated, they’ll actually enjoy it! Creating team policies and rules can be helpful, but you want to be careful that you aren’t creating a negative learning environment. A majority of ultimate players are not being paid to play. That means you are leading volunteers. Forcing volunteers to do something by exerting tight control over each and every team activity is unlikely to have a highly effective result. Think about your favorite class or instructor. Chances are this class or person was your favorite because you were granted an element of choice, or control, in your learning. As both an ultimate coach and educator, I initially struggled with relinquishing control effectively. The idea is not to exercise zero control, but to understand and identify your goals, create an effective plan for those goals, and delegate. This allows you, especially if you are a player-coach, an opportunity to fully participate in elements of practices and games. If you’re always the one in charge, and your approach to being in charge is to tightly control every element of the situation, you’re not going to have any remaining bandwidth for improving yourself in practice, or performing your best in games. There are many effective ways to delegate on an ultimate team. Some of my favorites include having different individuals, or small groups of players, in charge of warm ups, cool downs, drills, offensive strategy, defensive strategy, and/or team spirit. When you get more people involved in the leadership of the team, you increase buy-in and motivation among your players. Your knowledge base as a team grows because you’ve inoculated your approach to leadership with different perspectives and experiences. You also demonstrate that the team is about much more than completing arbitrary tasks in a tightly ordered manner. When individuals feel that they have ownership in the team’s success and that their experiences with the team are diverse, they’re much more likely to enjoy being on the team. Increased enjoyment means higher levels of motivation, which can be harnessed to create better on-the-field performance. Design your instructions so they are quick to deliver, easy to understand, and have a measurable outcome. If you’ve got something complicated to explain, break it down into a series of steps so that instructions can be delivered sequentially, with activities designed to reinforce each part of the process. Instead of describing your team’s new offense for 30 minutes, break it down into the operating parts. Design a drill that mimics the handler movement in the new offense and use the drill to introduce the concept. Then, you might lead a drill which uses your new approach to cutting. After this, you could explain quickly how these two drills compliment one another and how these techniques will be put to use in the new offense. Instead of lecturing, you’ve involved your players and presented multiple opportunities for quality learning experiences. Players have learned what they needed without struggling to stay engaged for long periods of time. Especially when we think of practice, there is an expectation that some educational activity will be taking place. The better designed your practices are to effectively communicate new information, the more efficient practice will become. Planning ahead and running efficient practices allows you to participate more and worry less about tightly controlling every minute of practice on your own. The most powerful educational experiences often come from our own failures. Highly motivated people can be especially hard on themselves when they experience failure. This is not a constructive way to deal with failure. As an educator, I am constantly thinking of ways I can allow students to fail, and learn from their failure, without any adverse consequences. In other words, when teaching new material, I provide a comfortable space for them to experiment. Ultimate practice is a great place to create this environment. Let your team know before a drill exactly what you want them to try to do and that it’s fine if they miss the target the first time. The key here is to be a supportive leader and guide people through their failure so they feel empowered with knowledge and practice so their next attempt can be successful. It’s not enough to watch your team fail over and over, then say, “Now we’re going to do this the right way!” You need to be providing positive words of encouragement along the way. Remember, don’t say too much—they are already being hard on themselves for failing in the first place. Instead, arm them with the small pieces of knowledge they need to be more successful in their following attempts. Giving players the freedom to fail in practice is a much easier skill to learn for an inexperienced captain or coach compared to granting the freedom to fail in an actual game. In a game-time situation, the pressure we feel to perform is much higher, and as captains and coaches we can instantly dismantle the great foundation we established in practice by reacting poorly to on-the-field failures. I’d like to encourage you to play the long game here. Instead of becoming emotional and/or negative, allow teammates to experience failure on their own. In other words, give them some time to mourn. The time to introduce tactics for preventing another heartbreaking loss is not immediately after the last point is scored. Once your players have had time to process, which also allows you time to strategize an effective way to address this failure, you’ll find people are much more receptive to reflecting upon their performance and discussing ways to improve. Remember, you are their guide, not their judge and jury. Don’t misinterpret this advice to mean you should avoid discussing failure. The key to using failures to your advantage is to be comfortable discussing them in an open, honest manner that puts both the emotional health and on-the-field performance of the team ahead of your individual competitive drive as a captain or coach. As I reflect upon my career as an educator, I understand that the process of becoming an excellent educator and leader is a long one. I still have many things I can do to improve, as does anyone in a leadership position. It’s important to acknowledge to both yourself, and those you lead, that you are still learning and that you care about improving. One of the most powerful actions you can take as a captain or coach is to admit when you are wrong. Use the criticism you receive constructively to improve the way you teach and lead. You won’t become a great captain or coach in a single week of practice, or over the course of a single season. Be honest with yourself about where you are in the process of improving as a captain or coach. Identify the areas which need the most attention, and work on those first. As you improve, challenge yourself by seeking feedback from your team and integrating that feedback into your approach. Consider how that laid the foundation for my approach to teaching. I began my career as an educator with a positive attitude and outlook about the people I’d be leading. I strongly encourage you to do the same. It’s easier to accept the difficult challenge of improving as a captain or coach when you have an optimistic outlook about your players and the future of your team. 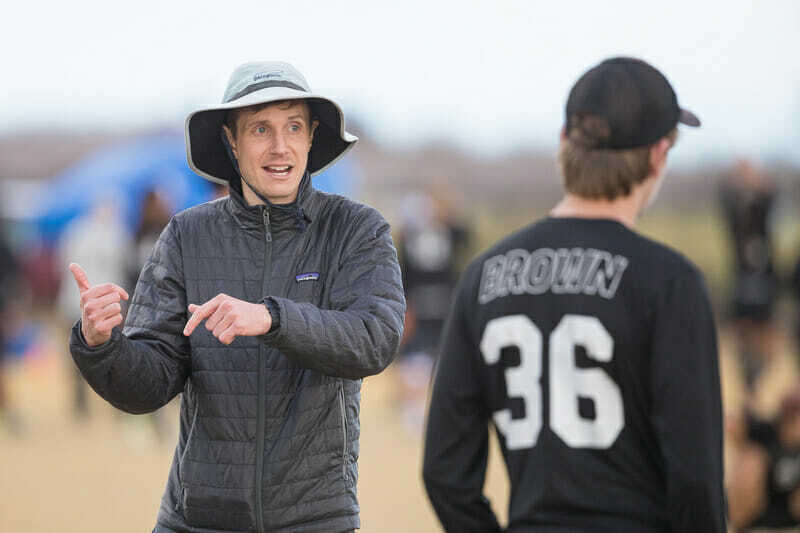 Bruce is an educator, video production professional, and researcher who loves the game of ultimate. Comments on "Tuesday Tips: Five Key Steps To Improving Your Leadership, Presented By Spin"